BraveRats* is another two-player ‘microgame’ from Love Letter designer Seiji Kanai, originally released under the title ‘R’ in 2011 but repackaged and re-themed by Blue Orange in 2014. 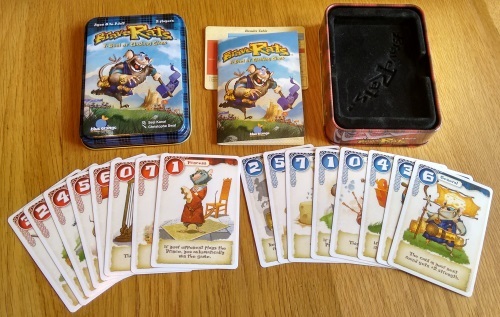 Microgames do exactly what they say on the (in this case quite literal) tin – here, for less than £10, you get a short rulebook and 17 cards, making it an incredibly portable little game. Another common microgame trait is a quick playing time, and BraveRats is no different. Game time is listed as five minutes in the rulebook and that’s pretty accurate, but of course you can simply pick it up and play again – especially as the time to set up the game weighs in at about five seconds. In terms of theme, well, forget it – this is two nations, each represented by eight cards, going toe-to-toe for the win. Thee is nothing ratty, or indeed bravey, here. But what you do get is a clever little battle of wits which boils down to a fun combination of luck, reading your opponent and weighing up the odds. BraveRats is listed as playing from ages 10 and up, but I expect you could go quite a bit lower – and also teach it to grandma (not that she might be too keen on a game supposedly about battling Scottish Highland rat clans…). To set up, each player takes their set of eight cards (numbered 0-7) into their hand and, erm, that’s it. Both players choose a card, then flip them face up simultaneously – the highest number wins a point, and the first player to four points wins. Got all that? While in essence this is ‘rock, paper, scissors’ with bells on, the clever bit comes from the card powers. Each player’s deck has the same eight cards, each of which has its own ability. High cards tend to be about winning through strength, lower ones by cunning – so the Prince (7) and General (6) will beat the Wizard (5) and Ambassador (4) – but the Assassin (3) flips the tables on the General, saying lowest card wins; while the Princess (1) simply beats the Prince – and wins you the game. Each card played is either left face up or face down on the table – face up for winning cards, to show the progression of your points. Draws are also handled simply – if you draw the same number, or a card power means the round is a tie in another way, these cards are set aside and the winner of the next round will claim an extra point. so in this way, if you draw the first three rounds, it comes down to the first player to win a round wins the game (as they’ll also collect those first three drawn points too). The writer: While BraveRats may initially seem superficial, there’s more tactical space here than immediately meets the eye. The real game is in considering what your opponent has left to play and as your choices whither, power plays start to surface. And also, after a round or so, you may see patterns forming in your opponent’s play that you can take advantage of. Of course there’s still a massive amount of luck involved, but don’t think this isn’t a game that can have it’s, “Mwahhaha, you fell into my trap” moments. The thinker: Unfortunately for me, not enough of the game falls between ‘too random’ or ‘too obvious’ to make it a keeper. The game is a very clever construct, or exercise if you will, in game design – and I would hope it will inform more complex and satisfying games in future. Personally I would much rather reach for ‘Romans Go Home’ from Eric Vogel, which adds just enough to this concept (programmed movement and locations to win) to make it sing in the same ‘light filler’ category. The trasher: Love it! BraveRats is a great way to kill a few minutes if you’re waiting on another game to end, or a few late people to show up. Sure, that may be a small window of gaming opportunities to fill – but when you can buy it for just over a fiver and it will slip into any other game box, why not bring it along to games night? While the rat theme is a little odd, they’re Scottish rats – leaving plenty of room to get your best Highlander impression on too – what’s not to like? The dabbler: This is a fun and sometimes tense little game, simple to pick up and teach, and with pretty nice cutesy/comical artwork. It’s also great for travelling, or going on holiday – and can create those funny moments when you play that one card that turns the game on its head. It does what a filler should do, but the limit of two players is restricting and I’d rather have a game that plays to a bigger crowd. Would I play? Sure! Would I rather play Love Letter? Absolutely. The first concern you run up against here is value – which may seem strange for a sub-£10 game. Some see it as a massive bargain, while others see a very thin game you can print on two sheets of A4 paper. The tin packaging here seems a strange choice. In a way this adds value (you’re getting a tin! ), but by the same token when you open it up it just helps highlight that there’s nothing really in it. To make things worse, this is a game many will want to sleeve as the cards get a lot of use – but to sleeve it, you won’t be able to use the nice velvety insert. Personally I’ve dumped that and thrown Love Letter into the tin with it, which works for me. But BraveRats’ biggest problem is the general consensus that it simply isn’t as good, or as appealing, as Love Letter. While some may call it ‘two-player Love Letter’, Love Letter is still as much fun as this with two players – and can take up to four, making it so much more versatile. For me though, BraveRats works as an enjoyable companion piece to its more illustrious sibling. While BraveRats will never shine as brightly as ‘that other Seiji Kanai game’ it is still a fine game design accomplishment. Kanai’s genius is in distilling a game concept down to the barest of bones while retaining the fun element and for me he has succeeded again here. As with Love Letter, BraveRats’ usefulness as a gateway game also shouldn’t be overlooked. From a royal court to a clan of chirpy rodents, these little card games are a great way of showing non-gamers that it’s not all about forcing yourself to play Uno with the kids, or playing bridge with your grandparents – there are light little games you can enjoy after the olds and the news have gone to bed too. For me, every household should stretch to a £10 budget to buy a really clever little card game for the shelves – and if that’s what you have, I’d suggest going to get Love Letter. But if you can stretch that budget to £15, grab yourself a clan of BraveRats too.